Here at KANE, we love warehousing. It’s a critical component of supply chains and we take great pride in the sophisticated application of technology to efficiently store products and get them to market. But sometimes it’s best to keep products moving. With the right set of supply chain characteristics, companies can leverage a cross dock strategy to speed factory-to-store-shelf cycle time and reduce distribution costs up to 50%. What Happens at the Cross Dock Facility? With cross docking, incoming items are matched with pending orders and staged for immediate shipment. This tactic reduces storage costs and the labor to receive, put away and pick inventory. Manufacturer ships inventory to cross dock facility, along with data on product type, volumes, and ETA. Orders are sent to the cross dock, where they are matched with in-transit inventory. The facility consolidates orders into proper shipping lanes and contacts carriers to set appointments. The cross dock facility then schedules just the right amount of labor in advance to prepare shipments when inventory does arrive. Inventory is received and placed in a staging area for a specific truck and is then loaded for delivery. Items arrive from dozens, even hundreds, of retail suppliers and, after a brief stop off, go directly to the store. What are the Benefits of a Cross Dock Strategy? Why Don’t More Companies Use Cross Dock Facilities? Cross docking is a proven supply chain strategy, but many retailers don’t use it because, frankly, it’s hard. You need tight planning and coordination among manufacturers, carriers and 3PL partners, as well as the systems to synchronize inbound and outbound flows. Have SKUs with strong, predictable demand, such as popular items, household staple items, and promotion items linked to advertising blitzes. Have supply sources that can provide the right product, in the right volumes, at precisely the right time. Receive products in “store shelf ready” condition. Consider cross docking another tool in your logistics belt. Just like anything worth doing, it takes deliberate effort and investment. However, the numbers don't lie. 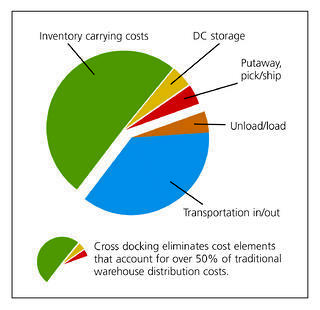 Cross docking eliminates cost elements that account for over 50% of traditional warehouse distribution costs.